Continuing our series on OpenCL optimization on the Qualcomm® Adreno™ GPU, we describe a multi-step optimization for apps that use the Epsilon filter. We demonstrate that OpenCL optimizations of the Epsilon filter on the GPU are device-specific. You can apply the optimization techniques we describe below to boost performance in other image processing applications and, indeed, in any general, memory-bound application. Given a pixel to be filtered, calculate the absolute difference between the central pixel and each pixel in its neighboring 9x9 area. If the absolute difference is below a threshold, the neighboring pixel value is used for averaging. The threshold is usually a constant. Often, the filter is applied only to the intensity (Y) component of YUV images, because the noise is mainly visible there. We do the same in our implementation. As in our previous post about accelerating the Sobel filter on Adreno GPU, we will show how the Adreno GPU can efficiently perform this highly parallel filtering operation using OpenCL. Moreover, we will examine a slew of optimization techniques that can be used to extract the best performance from the hardware. Use image object instead of buffer object. This makes the out-of-boundary check unnecessary, and more importantly takes advantage of the level 1 (L1) cache in the Adreno GPU. Use CL_R image format, since we care about the Y component only. Use CL_UNORM_INT8 image data type. This means that the pixels read into the signal processor (SP) are normalized to [0, 1] by the built-in texture pipe in the Adreno GPU. With the settings given above, processing a WxH sized image requires WxH work-items, each of which loads 81 floating point pixels to compute just a single output pixel. The problem is that this naïve implementation makes the algorithm heavily memory-bound and results in poor performance. For example, processing a 3264x2448-sized image takes 39.5 milliseconds (ms) on Adreno 630 (Snapdragon 845) and 78.3 ms on Adreno 530 (Snapdragon 820). Both are clocked at their highest respective frequencies of 720 MHz and 600 MHz. In this section, we will introduce several optimization steps in an incremental manner to see how the performance improves over the baseline (naïve) approach. The performance of the naïve implementation on the Adreno 630 is normalized to 1. Use 16-bit short data type instead of 32-bit floating (FP32) data type. Using FP32 to represent image data is a waste of memory, and Adreno GPUs have native hardware support for 16-bit operations. On the host side, the input image object adopts CL_UNSIGNED_INT8 image data type, while inside the OpenCL kernel, the pixel load is using convert_short4(read_imageui()) instead of read_imagef. 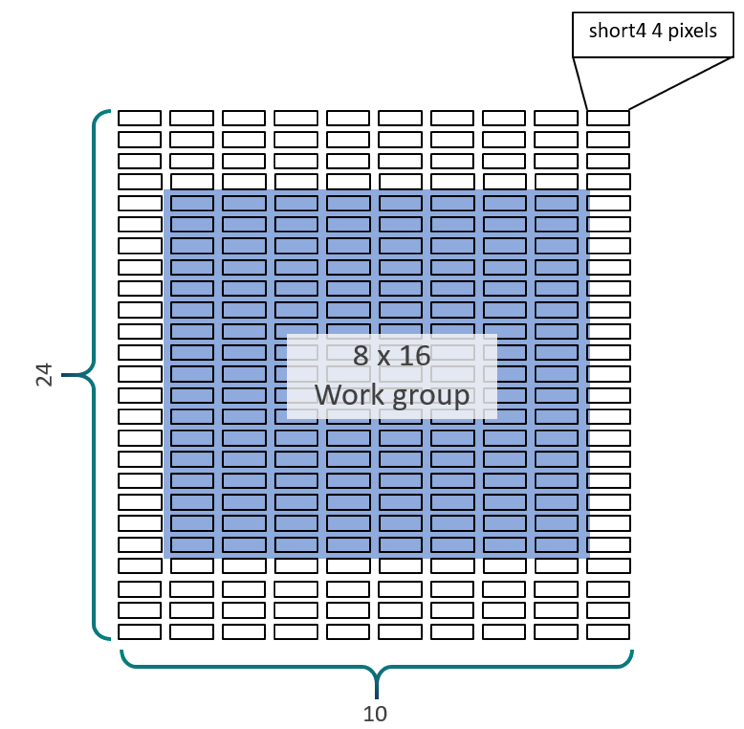 OpenCL does not have a function that directly loads 16-bit short data type from image object, but using convert_short4(read_imageui()) allows Adreno to directly load 16-bit short data type vector through texture processor (TP). Use CL_RGBA to pack four pixels into the four channels and thus better utilize the bandwidth of the TP, though the pixels are Y component. As shown in Figure 2, each work-item loads 9 rows, and three short4 vectors per row, while outputs one processed pixel. The number of load operations per output pixel is reduced from 9x9 = 81 (FP32/load) to 9x3 = 27 (short4/load). Next, we explore the possibility of reusing the neighboring data that is already loaded. Specifically, with the help of vectorized load, one work-item can compute four output pixels without increasing the number of load operations, as illustrated in Figure 3. Each work-item loads three short4 vectors and outputs four pixels. The number of loads per output pixel then falls by 4x, from 27 to 6.75. The global work size is appropriately decreased to (W/4)xH. We unroll the loop over rows. With the above changes in place, the performance improves by 2.7x over the baseline. Each work-item loads 9 rows of four short4 vectors and generates 8 output pixels. The number of memory accesses per output pixel drops from 3x9/4 = 6.5 (short4) to 4x9/8 = 4.5 (short4). The global work size is set to (W/8, H). On Adreno 530, this optimization yields a slight performance improvement, from 3.2x to 3.4x of Adreno 530’s baseline performance. However, the performance on Adreno 630 drops off slightly, from 2.7x to 2.6x of the Adreno 630’s baseline performance. It is worth noting that due to various factors, such as hardware micro-architecture changes and software/compiler updates, the effectiveness of optimization techniques may vary for the same kernels. Divide the global size into workgroups with a local size of WLxHL. The pixels needed to compute the output corresponding to each workgroup are cooperatively loaded into LM by the work-items that constitute the workgroup. 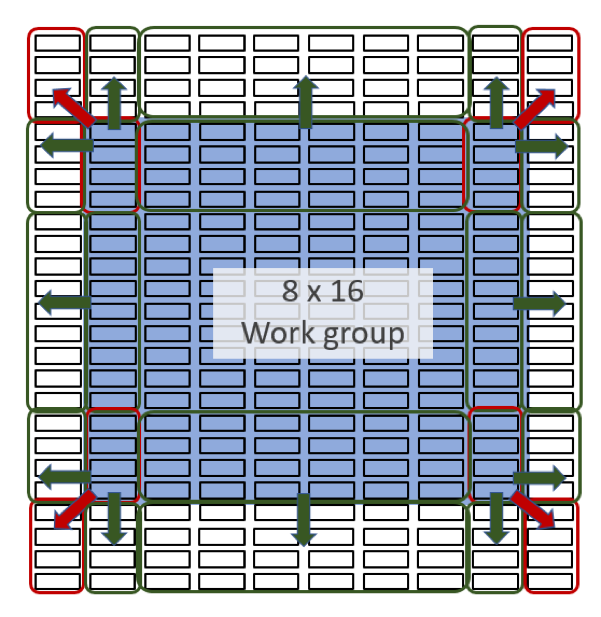 For local size of WLxHL, each workgroup requires (HL + 8) rows of (WL + 2) short4 pixels. Take a look at Figure 5 to convince yourself. 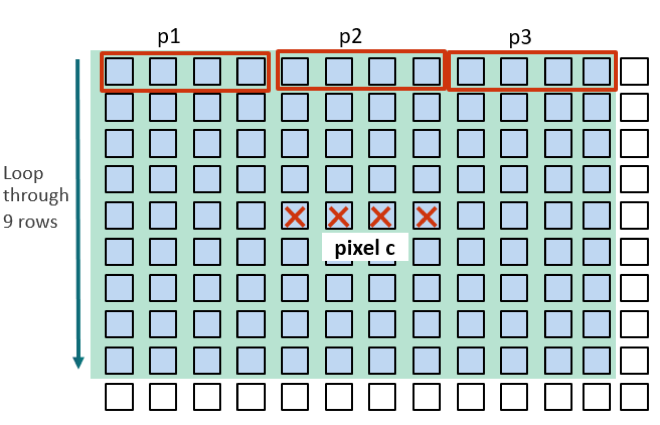 Each work-item of a workgroup loads a single short4 pixel to LM. The work-items near the boundary, however, must load extra pixels corresponding to the padding pixels. That said, no work-item would load more than 4 short4 pixels. Figure 6 illustrates this. Use a local memory barrier to ensure that all work-items in the workgroup proceed to the computation part only after all the work-items of a workgroup are done with the data load. 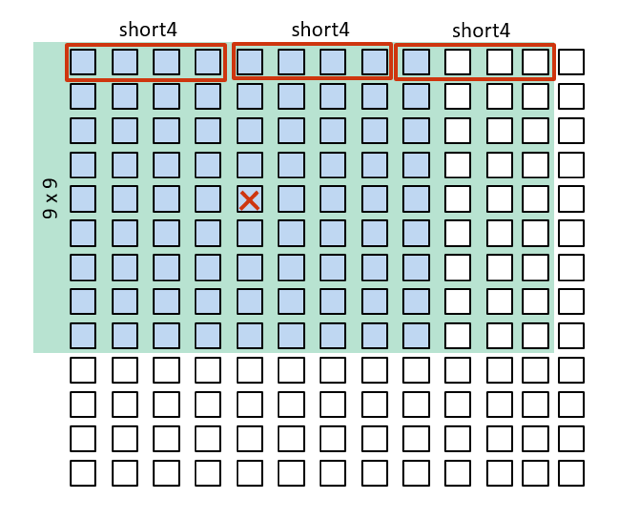 Figure 6: Extra pixels to be loaded by work-items at workgroup boundary. The arrows point towards the extra pixels that any group of work-items will have to load. Also, increasing the local size does not improve performance much because, although the padding overhead decreases, the overhead of synchronizing across a larger workgroup increases. These competing forces balance each other out. In fact, we saw similar performance for 16x16, 16x32, and 32x32 configurations. When we apply this optimization on top of the ones in step 3, performance improves from 2.7x to 3x of the baseline. The main difference is that the old code uses some costly hardware logic to handle the divergence. In the new code, all fibers in a wave execute the same ALU instructions, even though the data (the variable cond) may be different. The optimization steps we’ve followed in this post and their respective performance improvements on Adreno 630 are summarized in Table 2. In the naïve implementation, the algorithm is memory-bound. By data-packing, vectorized load and data reuse, it becomes more ALU-bound. The techniques introduced in this post can be applied to other image processing applications and, indeed, to any general, memory-bound application. 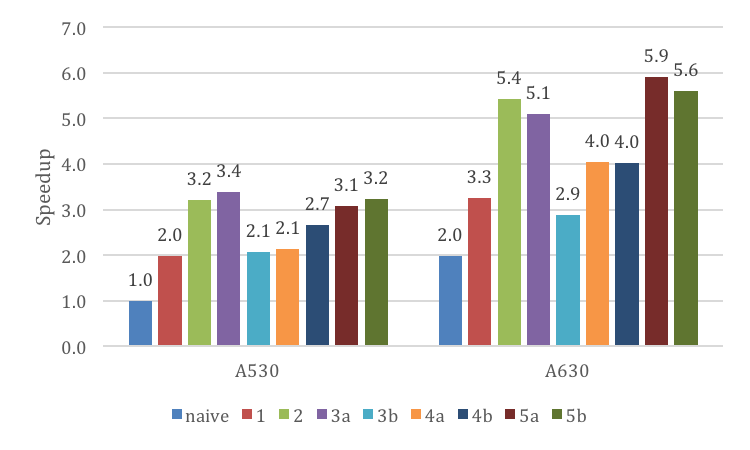 Figure 7 shows the comparative performance of all these optimizations across two generations of Adreno GPUs — Adreno 530 and Adreno 630 — with the performance of the naïve implementation on Adreno 530 normalized to 1. Figure 7: Comparison across Adreno 530 and Adreno 630. Performance of naïve implementation on Adreno 530 is normalized to 1. Note that on the Adreno 630, the greatest performance boost came from step 5a, whereas on the Adreno 530, the greatest boost came from step 3a. Thus, the main takeaway is that when the goal is to squeeze the maximal performance out of an OpenCL kernel, you need to tune the kernel according to the target hardware. This means not only tuning for a specific vendor, but also for specific devices provided by the vendor. Meanwhile, have a look through the Qualcomm® Snapdragon™ Mobile Platform OpenCL General Programming and Optimization Guide for more ideas, and download the Adreno GPU SDK to see how you can accelerate your own algorithms. Vaibhav is a GPGPU engineer in the GPU team. He works on performance analysis and benchmarking of Adreno GPUs for compute applications like Image Processing, Computer Vision, and AI.